O God, who didst burst the bands of Paul and Silas as they praised thee in prison by thy mighty hand, and didst spare the life of the Philippian Jailer to serve thee by thy divine mercy; we beseech thee to protect us and let thy mercy be upon us; so that we, and our households, may join with the Jailer and all thy saints, in perfect assurance of salvation, by believing on the Lord Jesus Christ, to whom with thee and the Holy Ghost, be all honor and glory, world without end. Amen. Many Bible scholars believe that the Jailor was a retired veteran Roman soldier. The city of Philippi was a major city that had been chartered as a "Roman Colonial City". Old soldiers sought retirement in these cities. The position of Jailer was most suitable for a veteran, and a fit soldier would have been the likely choice of the Roman officials. I suspect that this was not an elected position, but an appointed one. Who would have been better suited for the job than a man who had commanded in combat and proved his ability with men and the sword in the face of Rome's enemies, and lived to tell of it? An understanding of the Philippi will help us to understand the Jailer more. In 360 B.C. colonists from Thasos established "Krenides" The people were threatened by the Thacians in 356, and asked King Philip II for support. Philip conquered it, fortified it, and named it after himself (Philippi). It became the capital city for a while of Macedonia. The capital later moved to Pella. In 336 Philip II, father of Alexander the Great, was assassinated in at his daughter's wedding. In 42 BC the armies of Marcus Antonious and Octavian joined to defeat the rebels who had assassinated Julius Caesar at the Battle of Philippi. Brutus and Cassius committed suicide there. The historian Appian of Alexander wrote an excellent account of the battle in second century After the battle, the two victors spent a fortune on the city and granted it the status of "Roman Colony" the ruins of which can be seen this day. This was the first European city to have accepted Christianity, and it became a metropolis of Christianity. Its location on the Via Egnatia made it important to travelers and trade, and more especially, for the spread of the Gospel. Virtually all land traffic from the Middle East to Europe went through Philippi along this Roman road. A common route was the one that Paul took, landing at the port of Neopolis, and traveling 12 miles north to Philippi and the Via Egnatia. It is certain that Paul used it for his second and third missionary journeys. It is, I believe, more than just coincidence that Pax Romana played a significant role in the spread of early Christianity through: a common language (Greek from Alexander's conquests); superior network of roads, shipping, communications and the most advanced level of trade ever known; and a code of Roman Law backed by the best professional army the world had known - which also acted as a channel for the Good News within the ranks of the Legionaries. The news of Salvation by belief on the Lord Jesus Christ, often known as the Roman Road to Salvation. 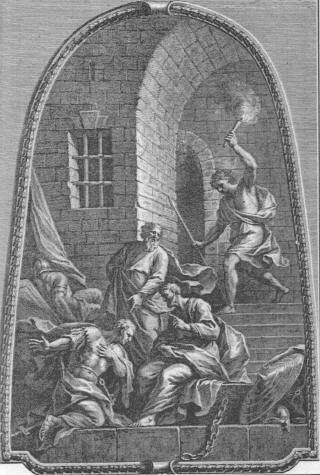 WHEN they had laid many stripes upon them, they cast them into prison, charging the jailor to keep them safely: Who, having received such a charge, thrust them into the inner prison, and made their feet fast in the stocks. And at midnight Paul and Silas prayed, and sang praises unto God: and the prisoners heard them. And suddenly there was a great earthquake, so that the foundations of the prison were shaken: and immediately all the doors were opened, and every one's bands were loosed. And the keeper of the prison awaking out of his sleep, and seeing the prison doors open, he drew out his sword, and would have killed himself, supposing that the prisoners had been fled. But Paul cried with a loud voice, saying, Do thyself no harm: for we are all here. Then he called for a light, and sprang in, and came trembling, and fell down before Paul and Silas, And brought them out, and said, Sirs, what must I do to be saved? And they said, Believe on the Lord Jesus Christ, and thou shalt be saved, and thy house. And they spake unto him the word of the Lord, and to all that were in his house. And he took them the same hour of the night, and washed their stripes; and was baptized, he and all his, straightway. And when he had brought them into his house, he set meat before them, and rejoiced, believing in God with all his house. And when it was day, the magistrates sent the serjeants, saying, Let those men go. And the keeper of the prison told this saying to Paul, The magistrates have sent to let you go: now therefore depart, and go in peace. But Paul said unto them, They have beaten us openly uncondemned, being Romans, and have cast us into prison; and now do they thrust us out privily? nay verily; but let them come themselves and fetch us out. And the serjeants told these words unto the magistrates: and they feared, when they heard that they were Romans. And they came and besought them, and brought them out, and desired them to depart out of the city. And they went out of the prison, and entered into the house of Lydia: and when they had seen the brethren, they comforted them, and departed.